That changed really occurred once Petiot came back to the U.S. to take over bartending duties at the King Cole Room in the St. Regis Hotel. According to the King Cole Bar and Saloon’s website, Russian prince and businessman Serge Obolensky wanted a Bloody Mary, but wanted it spiced up. Petiot added salt, pepper, Worcestershire sauce, and lemon juice. He shook it into the original half and half mixture Jessel suggested, and a star was born! Looking at the King Cole Bar’s site, you won’t find a listing for the Bloody Mary. You will find one for the Red Snapper, which is what the cocktail was renamed by the owner, Vincent Astor. He thought that the name was too vulgar for an upscale establishment. The name change also led to speculation there was a change in the base spirit. Gin was far more common in the United States at that time, but vodka was not as scarce as we’d like to imagine. Cocktail books from the era, notably the 1941 Cocktail Guide and Ladies Companion by Crosby Gaige, listed the Red Snapper as made with vodka, not gin. Lucius Beebe wrote about it several times in the New York Herald Tribune around 1940, mentioning vodka as well. The confusion may come from the fact that gin is used in the modern Red Snapper variation of the Bloody Mary. Stir gently, pour all ingredients into a highball glass. Garnish with celery and a lemon wedge (optional). In a mixing glass, combine all the ingredients. Add ice and roll back and forth to mix. Strain into an iced goblet and garnish with lemon and lime wedges on a side plate. And there the deviations begin. It is a small one, but shows that every Bloody Mary offers the opportunity for the bartender to leave their own imprint on it. There are variations where you can substitute the tomato juice for tomato water. Epicurious has a nice base recipe for tomato water, and all you need is 10 medium tomatoes, some salt and time. There are many tomato water recipes that include spices in them, but this one is an excellent base. If you are going with traditional tomato juice, the ingredients you can add cover the spectrum. The list includes, but is not limited to: bitters, pickles, pickled peppers, fennel, Creole seasoning, Cayenne pepper, sriracha, mustard, steak sauce, barbecue sauce, lime juice (substituted for lemon juice), orange juice, vinegar, cilantro, molasses, balsamic syrup, soy sauce, and a variety of beers. You can make it sweet, savory, blistering hot or relatively mild. There is no limit to how many ingredients you can add. There are a few additions you can make to the Bloody Mary that changes the name and the flavor profile entirely. Adding clam juice to the tomato juice will create a Bloody Caesar, which is extremely popular in Canada. Adding beef broth brings a rich taste to the drink and creates a Bloody Bull. Along with the variations in the tomato juice, there are several variations in the base spirit you can use. Much like a martini, some connoisseurs will consider it a Bloody Mary with either gin or vodka. There are some fine establishments that make their Bloody Marys with a nice whiskey. Almost universally, adding tequila changes it to a Bloody Maria. In some Bloody Marias you can find equal parts tomato and either orange or pineapple juice, turning the mixer into something resembling a sangrita. If you go with vodka for your base spirit, there are still many options to consider. It should blend into the cocktail and disappear, so don’t think the well vodka is going to cut it! Rarely will you see a specific vodka called out for the creation of a Bloody Mary, but few flavored vodkas marry perfectly into the rich mixture. Bakon Vodka offers a savory and meaty undertone to the cocktail, especially if you have a crisp slice of bacon as a garnish. UV released a spicy and sweet Sriracha vodka at the end of 2013 that will add a little extra kick to you morning drink. Stolichnaya offers Hot, their jalapeno tinted vodka for the Bloody Mary set. And if you are really looking to sear the taste buds off your tongue with heat, 100,000 Scoville Naga Chili Vodka is the spirit for you. The granddaddy of all pepper vodkas goes to Absolut, and their Absolut Peppar. They saw the direction the cocktail culture was going in the 1980’s. It was embracing the Bloody Mary with gusto. This made it easy for Absolut to make it the first flavored vodka they released in the United States. There are some bars that pride themselves on what goes into the Bloody Mary mix. There are some where the cocktail is not the story, it is entirely about the garnish. There are garnishes that, over time, could be considered legendary. They are not garnishes as much as they are sculptures, monuments to what you can do with time, wood skewers, a wide ranging menu, and ingenuity. They are meals in and of themselves. Or they are pieces of Bloody Mary lore. 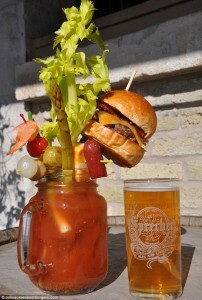 O’Davey’s Pub in Fond du Lac, WI, offered a limited edition Bloody Mary garnished with sausages, popcorn, mini-burgers, nachos, and more. Score on Davie in Vancouver, BC also has a menu featuring over the top Bloody Caesars, including the Grilled Chaesar (complete with a grilled cheese sandwich), and the Luongo, which would be served in a large silver chalice, but just could not quite make it there. Sunda in Chicago makes some off-the-chart Bloody Mary garnishes, including ones with Wagyu beef, soft shell crabs, herb roasted potatoes, tocino (Spanish bacon) grilled cheese, and a variety of other gourmet treats. Lest you think only the north goes out of their way for garnishes, The Nook in Atlanta, GA offers the Bloody Best, covered with tater tots, steak, eggs, bacon, and other savory toppings to a spicy cocktail. The undisputed champion, though is Sobelman’s in Milwaukee, WI. They have made headlines before with The Masterpiece and The Beast, but what they did in August this year set a new bar. They deep fried a four pound chicken and set it on top of a jug of Bloody Mary. Then they added cheeseburger sliders, bacon wrapped jalapeno poppers, mini-sausages, and just for some traditional flair, some celery and olives. It sold for $50, and 10% of the proceeds went to a local hunger task force. There is a bar out there right now figuring out how to outdo that garnish. 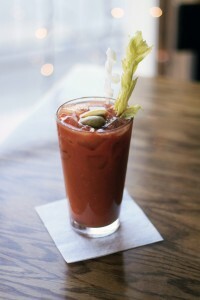 What DOES make that great Sunday morning Bloody Mary? Is it the spicy concoction in the glass? Is it the extreme garnish, some may say meal, that sits on top of the glass? Or is it just the tomato juice and food combination that works to help shake off that hangover? Like the cocktail itself, the real reason is open to interpretation. It is one of the few recipes in the realm of bartending that allows the person mixing it to translate it into whatever they want it to be. No matter how you assemble it, the Bloody Mary is a labor of love and a wonderful drink to spend a Sunday morning with. Editor's note: While we at Alcohol Professor always encourage you to make your own cocktail mixes over buying pre-made ones, there are some exceptions on the market that offer high quality alternatives with unique ingredients. In this case, homemade BBQ sauce! Ubon's Bloody Mary Mix came to market when two nice Jewish boys from NJ dabbling in BBQ discovered the rich, natural texture of this Bloody Mary mix. It's based on a family sauce recipe that was used in the morning BBQ pre-competition Bloodies served up by the BBQ circuit's most hospitable third generation pitmaster, Gary Roark.